A machine that can scientifically evaluate the make-up of Thai food has been developed with the help of the country's ex-prime minister. Fed up with poor Thai food when visiting other countries, Yingluck Shinawatra came up with the idea of a machine to rate food samples against authentically-prepared dishes. The food robot was due to be unveiled in Bangkok on Tuesday. It is part of a growing trend to use computers to analyse food. 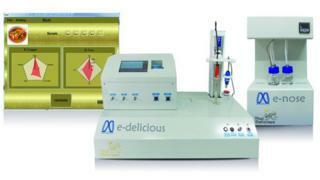 The machine, dubbed e-delicious, has ten sensors which create a chemical signature for food, which is then measured against a gold standard recipe, as approved by 120 taste testers. "An electronic nose for measurement of smell by an array of 16 gas sensors, an electronic tongue that allows us to measure sourness, sweetness, saltiness, spiciness, and a central processing unit that gathers data and interprets the result." Each test takes no more than 30 minutes. Thai food is one of the world's most popular cuisines but, according to the website, "the flavours of Thai food in many restaurants and in hotels abroad are deviating from the authentic ones." The government, which was ousted by a military coup in May, was so concerned about the idea of inferior Thai food that it set up the Thai Delicious committee and gave it $100,000 (£61,000) to build the machine. Each recipe has had its chemical make-up recorded in a database to compare with other versions. Food samples are inserted into the box to be analysed and are rated out of 100. In the case of a Thai green curry, the dish will be tested to ensure it has the right mix of basil, curry paste and coconut cream. The team from the Thai Delicious committee has also created an app with authentic recipes for chefs to use.